/ins. 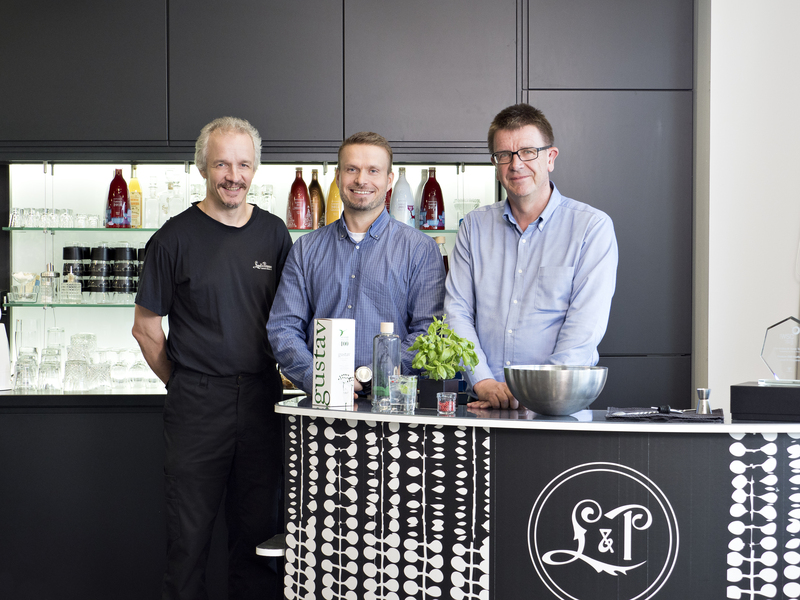 It was a great moment for the Finnish family distillery Lignell & Piispanen, when the company’s new Gustav Dill vodka was at the top podium in the International Wine and Spirits Competition (IWSC) in London. The victory was a good birthday present for the company that turned 165 years just after the competition. It may not be the first time a vodka is flavoured with dill, but it’s hard to think that anybody has put as much effort on product development of a similar product. A true winner needs luxurious packaging, starting from the bottle. Renowned Finnish designer Jaani Vaahtera was hired to design the bottle so that it would reflect the pure essence of the vodka. The design itself had no impact on the results in the competition, as the judges test the drinks without seeing the bottle or packaging. The solution was to ask Starcke, a Finnish company specialized in post-processing and brand protection, to create a bold and intelligent package for the product. It was the first time the two companies had worked together and the result was – a winner. At Starcke it was Ilkka Harju, Head of Design & Innovation, who handled the process from start to end. As the design bottle was very heavy, the box needed strength and extremely good printability, a combination he knew would be undoable with the folding boxboard qualities normally used in such solutions. When Stacke, Orapac and Lignell & Piispanen contacted Kotkamills and explained what they needed, they were impressed how the company instantly begun to develop a new board quality that met their demands. The result was a strong 450 gsm folding boxboard with a thickness of 800 microns. According to Ilkka Harju, it could be described as light heavyweight, as it protects the bottle very well but weighs less and has much better overall performance than light corrugated cardboard that was the other alternative. 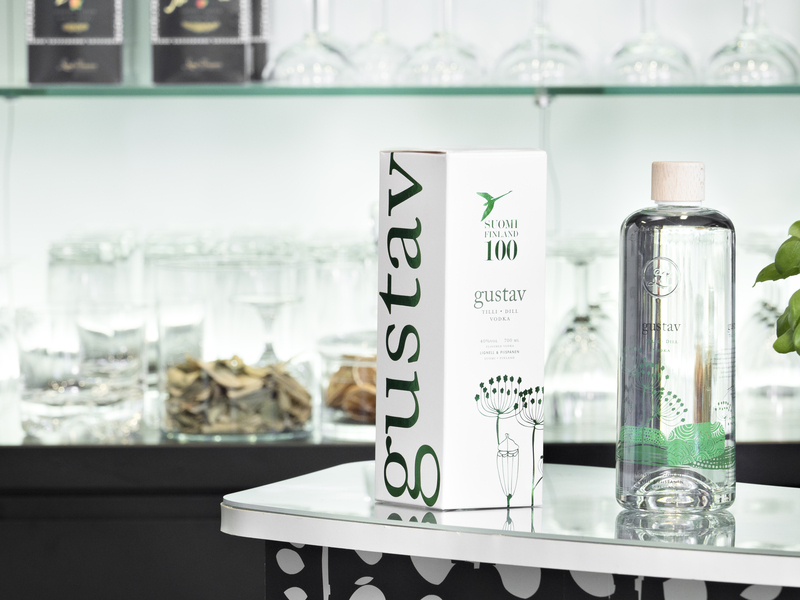 The new board grade, incarnated in the package of Gustav Dill vodka, will be presented at Luxury Packaging in London in September and Luxe Pack in Monaco in October. And what is the customer’s judgement? The vodka is named after the founder of the family company Lignell & Piispanen, Gustav Ranin, who established the company in 1852 in Kuopio and started the distillery in 1859. Tasting notes at IWSC: Colorless, dryish, smooth, rich dill notes, slightly spicy, balanced. Gustav dill vodka recipe was created by product developer Heidi Nylund. The bottle is designed by the internationally rewarded designer Jaani Vaahtera and the packaging was designed by Starcke. The specially designed 800 mic 450 gsm folding boxboard was delivered by Kotkamills. Printing and converting was done by Finnish Orapac, one of Europe’s most modern folding carton converters. Kotkamills is a responsible partner that delivers renewable products and performance to its customers' processes via product innovations created from wood, a renewable raw material. In summer 2016, the company started up a new board machine producing AEGLE™ Folding Boxboard and ISLA™ Food Service Boards, including the capability to add easily recyclable barriers on-machine. All Consumer Boards material solutions are fully recyclable and repulpable. The key brands of the company include also Absorbex® and Imprex®, both innovative laminating paper products for the laminate, plywood and construction industries. Moreover, Kotkamills offers ecological, technically sound and visually attractive wood products for demanding joinery and construction. Starcke is a Finnish company specializing in brand protection and in designing packaging that considers, for example, the form of the package, the technical structure, the raw materials used in the packaging, the usability of the packaging, the intelligent properties that accompany the package and the graphic appearance of the package.